Could the LEGENDARY LIGHTS OF CLIFTON MILL be the BEST holiday Lights in the Nation? It's up to you Miami Valley! Voting is open through December 15. LEGENDARY LIGHTS OF CLIFTON MILL in running for USA Today’s BEST HOLIDAY LIGHTS! 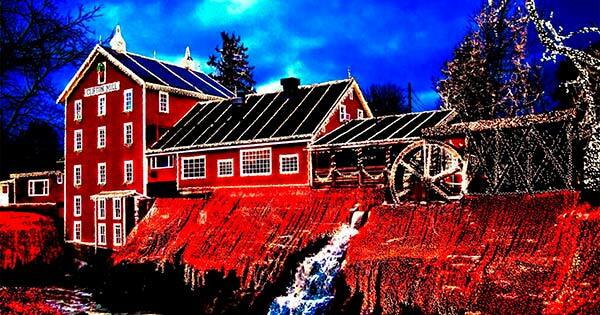 For over three decades the ‘Legendary Lights of Clifton Mill’ have ‘turned on’ for the holiday season brightening the lives of kids of all ages. Folks in these parts know all about us, but now we have an opportunity to spread our Christmas Holiday tradition with the entire country through USA Today’s 10 Best Public Holiday Lights Display. You can vote every day through December 15. Let’s do this Ohio and Miami Valley! The Legendary Lights of Clifton Mill’s gates open at 5pm, and precisely at 6pm, over 4 million lights brighten the night instantly, transforming the mill and gorge into a shimmering world of Christmas wonder. We are open 7 nights a week through December 31. What began as a simple idea of stringing a few strands of lights on the historic mill for the enjoyment of family and friends is now one of the largest outdoor holiday displays in the country. Now, millions of lights later, the Legendary Lights of Clifton Mill decorate the mill, trees, river banks and almost everything in between. Including the water wheel. One of the big crowd pleasers is the covered bridge synchronized light & music show, which occurs hourly each night. For more information, see Clifton Mill Christmas Lights 2018.